The garden may have plenty to offer at this time of the year but one of Annie’s favorite fresh veggies is the green bean. Looking for a great variety to plant next year or buy at the local farmer’s market? French/Filet Tavera is a small, tender green bean. It lends itself to the summer gamut - from sautés to the refreshing salads. 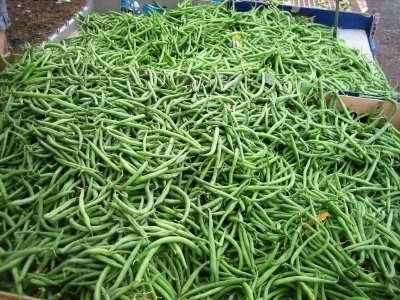 The standard green bean varieties like Provider tend to be too hefty for these types of dishes, especially if they hang on the vines too long. Chop a fistful of fresh spearmint and fresh basil leaves (approximately a ¼ cup of freshly chopped herbs) Try different herbs if you wish but this offers a flavorful Mediterranean flair. You can also add the juice of a ½ lemon to give it some zip. Lemon, mint and basil are extra special on a salad. Grilled chicken marinated in lemon, garlic, olive oil, salt and pepper or grilled fish in a light marinade are great headliners to this easy side dish. For a little French lesson, let’s use a quote by Curnonsky, which doesn’t sound like a French name at all but it came up under French quotes. “Fine cooking is when the things you have cooked taste as they are.” Enjoy these summer days and veggies while in season. It doesn’t get any fresher than this!